Home Amazon Silicone Building Blocks Bricks LEGO Tape – DEAL! Ever hear of LEGO Tape? It looks super cool! Hurry and get the LattoGe Silicone Building Blocks Bricks LEGO Tape today for as low as $8.99 $4.99 from Amazon!! Amazon Prime members get FREE 2-day shipping!! If you are not a Prime member, get FREE shipping when you purchase $25 or more of eligible items across any product category. Check out the Silicone Building Blocks Bricks LEGO Tape details below. Peel-and-Stick Baseplates – Self Adhesive Brick Building Plates – Compatible With Most Major Brands of Building Bricks, like LEGO Blocks, Mega Bloks, Kreo and most major toy building block systems. The absolute easiest way to create your own play table or wall for your little builders! Build on curved surface, around corners, on other toys,Sideways,even upside down. Worked on walls, tables,notebook, pencil case and lunch box anywhere your kiddo wanted it to! Environmental protection durable food grade silicone, bendable, flexible, shapeable, easy cut to any size, removable and reusable-tape sticks. You can use again and again, do not leave a mark when they are removed, take your building blocks to the max. 3M self-adhesive tape allows you to take your builds anywhere you want, the building blocks tape is high strength paste ability, which can be washed, and the back of the acrylic plastic can be used to repeat past,.can be reused about 200 times and can make construction toys sticks to walls (do not stick it onto dusty wall), desks, child room, kids art decoration. This is a must have for your Lego lover. It opens a whole new world of building with Legos. Your imagination is the only limit. Let your kids make bigger and more awesome creations with a large work surface. Turn any surface into a building-block base. Building Blocks Tape for Lego Loops. Creativity Development, Fun and Flexibility, Reusable Adhesive Strips are so cool. 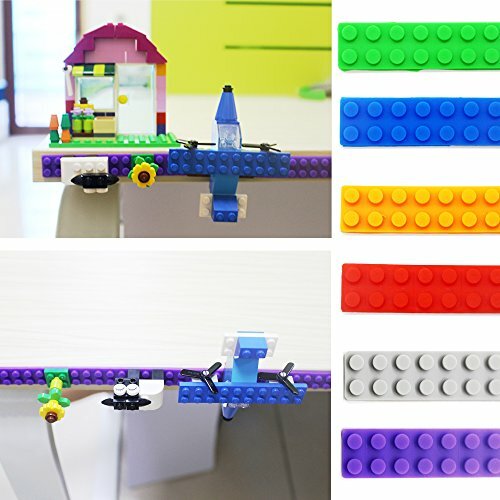 Buy the LattoGe Silicone Building Blocks Bricks Tape Stick Baseplate Plates for Lego from Amazon. Next articleFast & Furious 1969 Dodge Charger Daytona & Drift Launcher Vehicle ONLY $2.92!